Cat Fanciers have specific needs: Keep good records, produce pedigrees, do genetic calculations. The ultimate tool for the fancier is now here: The Cattery’s Standard™ 2019. The Cattery’s Standard™ 2019 offers the cat fancier a thorough and easy-to-use product for tracking pedigrees, genetics, competition, veterinary history, breedings and financial transactions. More than any other product, The Cattery’s Standard™ is thorough. The Cattery’s Standard™ was written in co-operation with ten cat fanciers of various backgrounds, most of whom had little or no computer expertise. Why did we stay away from computer experts? Because we did not want a product for computer experts, but rather one which did the job for cat fanciers. Only The Cattery’s Standard™ 2019 has PedFast™ V, the fastest and easiest way to get pedigree ancestors into a computer program. Other programs require you to enter ancestors from the oldest generation first, linking the parents as you enter the animal’s record. A real pain. Only The Cattery’s Standard™ puts you into a form which looks and acts like a five generation pedigree (we keep generations going back forever, but can only fit five at a time on the window). If a cat exists in the database, you click and pick him/her off a list. We fill in the rest of the pedigree. If you do not know the cat’s registration number, no problem. Leave it blank. We’ll put one infor you. We give you visual confirmation of the results. You see it right away. You can add titles without leaving the window. How about capacity to hold all these pedigrees? One of the leaders in this market can store 65,535 cats. We can handle 2.1 Billion Cats! We also let you freely exchange cats with each other using our BXF™ Import-Export facility (more about this later on). How about pedigree printing? You have choice of font. You have choice of color for titled cats (requires a color printer). If you have a scanned picture of your cat, we’ll print it on the pedigree too. Simply put, it’s the best and easiest program for cat fanciers. Competing was never so easy! Competition is so easily tracked with The Cattery’s Standard™ that you will hardly realize that you have made an effort to track it. Every ring and judge is easily entered. 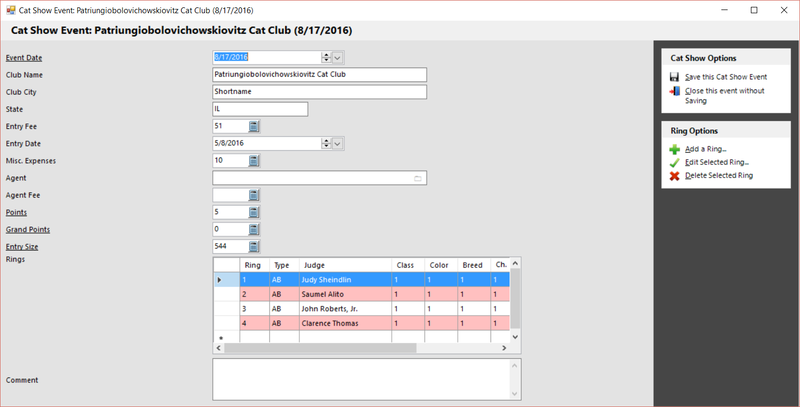 Unlike other products which started out for dogs and were made "compatible with" cats, our competition module can accurately track what a real cat show does. To the left is a thumbnail of our cat show record. Click on the picture to see a full-size picture of how we store our records. We can handle any number of rings from 1 to 100. We can store up to 65,536 shows per cat! Of course, you have a variety of reports you can produce, including judge tracking and individual cat performance statistics. The Cattery’s Standard™ has it all. Vet Visit tracking by cat, by vet, or by reason the cat went in. Financial tracking of costs. Define your own visit reasons (unlimited capacity). 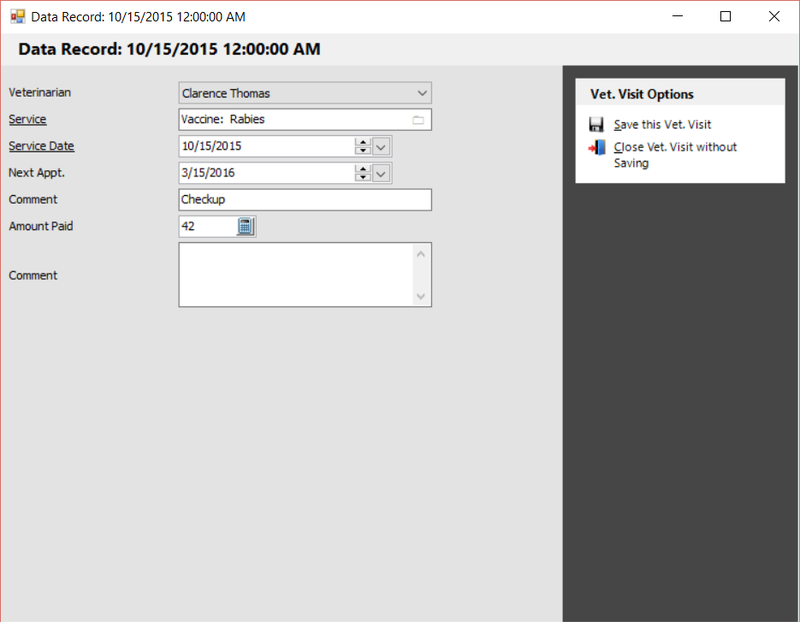 Set reminders for follow-up visits automatically. The Cattery’s Standard™ tracks and prints vaccinations separately. You get the most common vaccinations pre-loaded, and can add, change or delete an unlimited amount of records. Of course, you get reports, both on paper and on screen. The Cattery’s Standard™ tracks heat cycle information for all your females. Quick, easy, reliable. The Cattery’s Standard™ excels at one thing more than any other cattery program! You can share your data with anyone. The Cattery’s Standard™ exports your records into its proprietary BXF™ format, and will read BXF™ files as well. This means that anyone else with The Cattery’s Standard™ can send you their cats for use in your pedigrees without involving a third party or paying any sort of fee. This also means that, as they become available, you will be able to download free databases full of cats! The Cattery’s Standard™ is smart enough to merge databases correctly, and not to make duplicate cats. 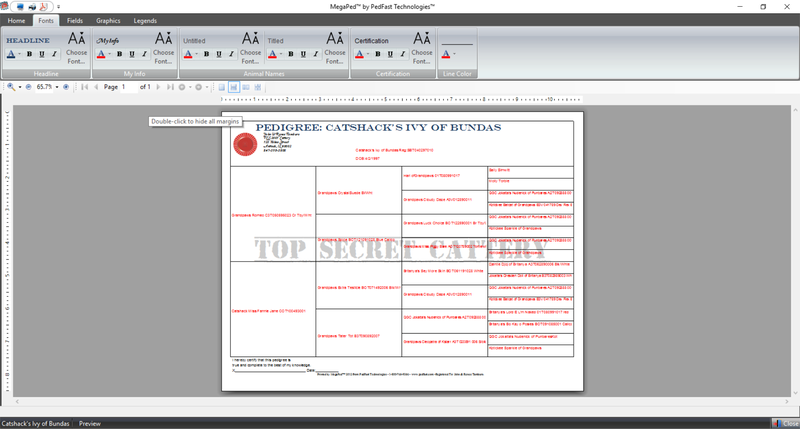 The Cattery’s Standard™ can use one of our free utilities to read in CompuPed™ 3&4, Breedmate, Cat Trax and other databases and make them into BXF™ files. You therefore can use the databases of your friends with these programs)! Free! The Cattery’s Standard™ 2019 has DataMaster, redefining the power of cattery software. Now, you can fix naming errors such as improper use of the possessive in cattery names, bad capitalization rules, goofy color abbreviations and the like in seconds, not days! Change names and/or colors to ALL UPPER CASE, all lowercase or use our proprietary "Smart Capitalization" feature to intelligently capitalize each word in a name. It handles contractions, as well as O’ names and the like! Change the beginning or any part of the registered name to anything you wish, for every matching cat in the database. Do the same for Color and Call Name! Here is the power you need to make your database the best it can be! Got a Question about the program, ask Sheegwa™! The Cattery’s Standard™ 2019 is by far the easiest cattery program ever devised. There is simply no contest. However, with all of the power in TCS 2019, there are times when there is a question that simply needs to be answered. On every screen in TCS 2019, the help for that screen can appear in a bar to the right of the page. Click the Sheegwa™ button to have the help always appear. If you don’t need the help, just click it again and it hides away. Save yourself time and maybe even a call to support! Use Sheegwa™ to quickly answer even the toughest questions! When it comes to making your program easy to use, the others haven’t even thought of what we’ve already done! The Cattery’s Standard™ offers genetic information of a different flavor. Instead of just spitting out one number per cat for inbreeding (we do that as well. In fact, out of all cat programs, only TCS hascertified accurate results ), you can enter traits on cats in the pedigree going back ten generations. You then can analyze the traits of the ancestors and see how often they appear! Get a feel for your planned litters from a whole new perspective. That’s just one benefit. See the impact of ancestors on a pedigree with our inbreeding percentages report. See a pedigree for a planned mating with the Hypothetical Pedigree function. The next generation of genetics is here now. TCS 2019 offers you the ultimate in Pedigrees: MegaPed™. MegaPed™ uses custom-designed formats to empower you to create the most stunning pedigrees you can imagine. With a simple interface, tight integration with TCS 2019 and flexibility unequalled in any programavailable today, MegaPed™ is the answer to virtually every pedigree question. Saved Layouts: Choose the kind of pedigree, the options, the colors and font styles. Then save that layout for future use. You can save an unlimited number of pedigree layouts and choose between any of them, quickly and easily. Multiple formats: MegaPed 2019 ships with seven layouts, including box pedigrees and a picture pedigree that shows the picture for every animal in the pedigree! You can use Pedcasso™ (Pedcasso 2019 is coming soon) or a Pedigree Power Pack™ to add literally unlimited numbers of pedigree layouts. 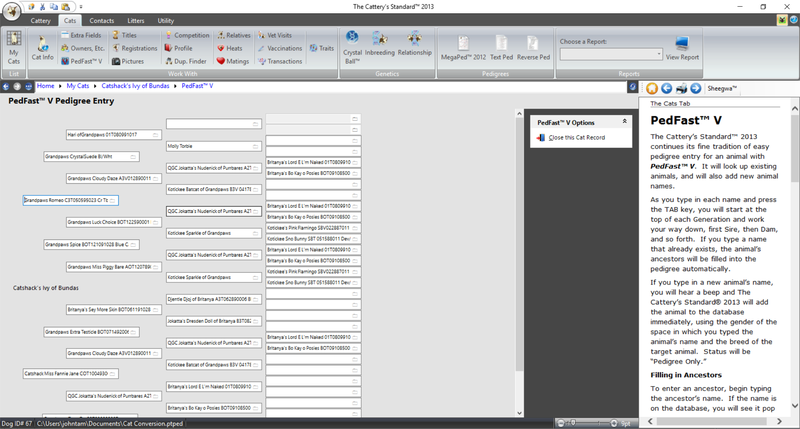 Drag and Drop Configuration: From a list of over 20 fields, plus all registries in TCS 2019, you can drag and drop them onto any one of three lines for that animal. This means that you can custom-design the information shown in the pedigree for each animal, including typing in the headings you want, where you want them. Multiple Graphical Watermarks with Built-In fading! This highly-demanded feature has been implemented with imagination and style! You can choose to save up to 65,535 different watermark graphics to be displayed behind the pedigree and choose which one to use. You can choose the size of the watermark. Finally, you can use our built-in fade button to lighten the stored graphic so it will display properly, without having to buy an expensive outside graphics program to accomplish this task. The Watermark engine will import graphics from JPG, GIF, BMP, PCX, PNG, TIF and WMF/EMF files. You will amaze yourself with the incredible beauty of your pedigrees. 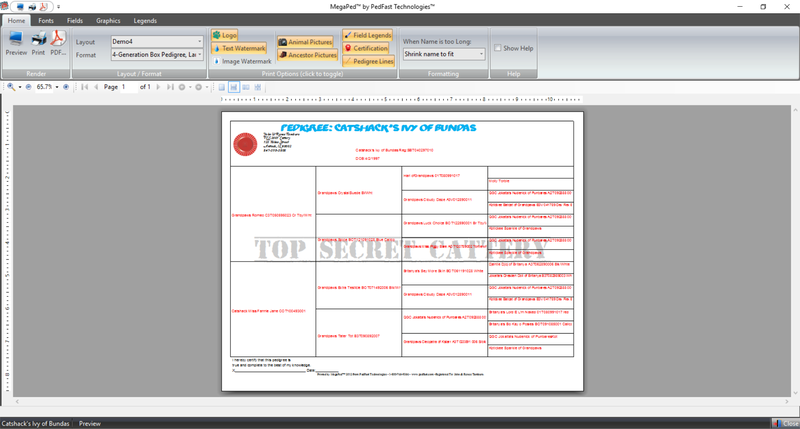 Save to Adobe® Acrobat™ PDF Files! Here is something that no other program supports! 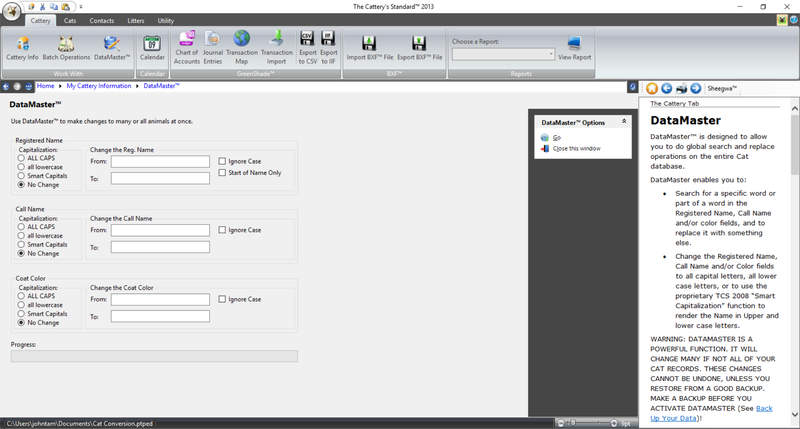 No need to buy Acrobat for over $200 in order to make PDF files, complete with full fonts support, of your pedigrees. It’s built in here and costs nothing extra! Save to Popular Graphics Formats: Save your pedigree in GIF, BMP, PCX, TIF, JPG and WMF/EMF formats. Multiple Logo Graphics: You can store up to 65,535different logo graphics and choose which one to put on your pedigree. VGA display with at least 16-bit color or better, with a minimum screen resolution of 1024 x 768 pixels preferred. 18-24MB of free disk space (34MB is ideal). Generally speaking, any Windows computer made on or after January 1, 2012 will run TCS 2019 without issue. Gigantic Capacity -- 2.1 Billion cats per database, and you get two with our program! Crystal Ball™ Genetic Analysis Module -- Inbreeding Percentages, Hypothetical Pedigree, and our own Trait Analysis report! Complete cattery record-keeping -- Ownership, matings, litters, kitten disposition, and kitten daily record-keeping. Built-in Security, built-in calendar, built-in reminders. Others talk about ease of use, thoroughness and support. We have delivered, abundantly!